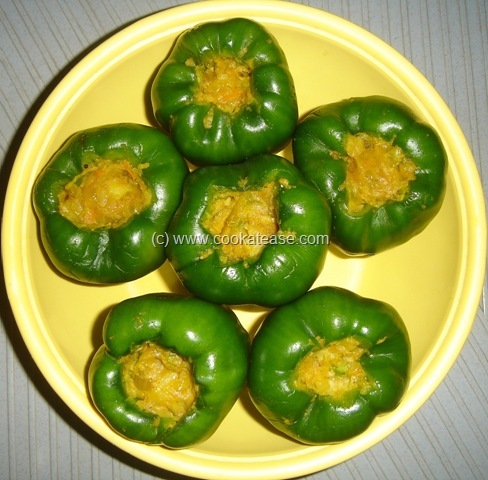 Capsicum is also known as ‘bell pepper’ due to their shape like a bell. It is available in many colours like green, red, yellow and orange. It is rich in vitamin C and A, apart from other nutrients. 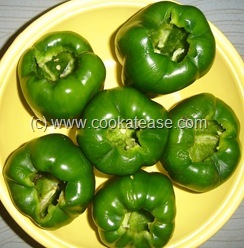 Capsicum is also called as ‘sweet pepper’ and as ‘paprika’ due to the spicy powder made from this. In Tamil, it is called as ‘Kudamilagai’ and as ‘Shimla Mirchi’ in Hindi. 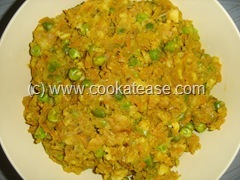 In Indian cooking, it is used in different dishes. It is very attractive, eye-catching, aromatic vegetable. 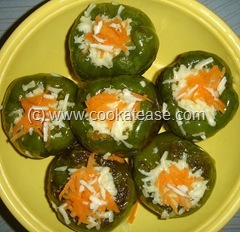 Here I prepared stuffed capsicum. Cooking time: 30 to 40 minutes. 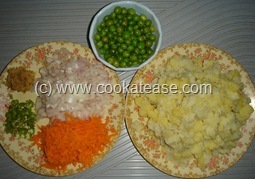 Boil, peel and mash potatoes; chop onion, carrot, green chilli and ginger; boil peas. Heat a pan with one tea spoon of oil; fry onion, green chilli, ginger and half of chopped carrot (half for garnishing); then add peas, all dry masalas and fry well; add mashed potatoes, cook for few more seconds; stuffing is ready. 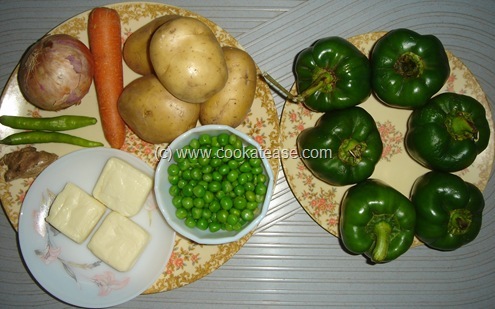 Now wash and wipe capsicum with a cloth; with a sharp knife, remove the stem without breaking the capsicum as shown in photograph; with the help of a spoon, gently remove seeds and other things from inside to make capsicum empty. Now fill the stuffing slowly with a spoon. 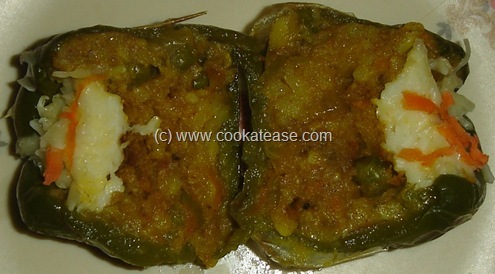 Now heat a pan, add ½ tea spoon of oil; place 3 stuffed capsicum, cook in low flame by turning sides; cook all sides till you get brown spots on the surface; repeat this for other 3 capsicum also. 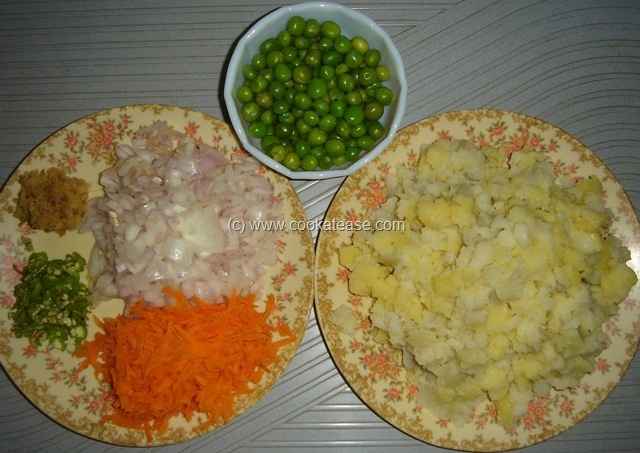 Now arrange this in a bowl, garnish with grated cheese and chopped carrot. 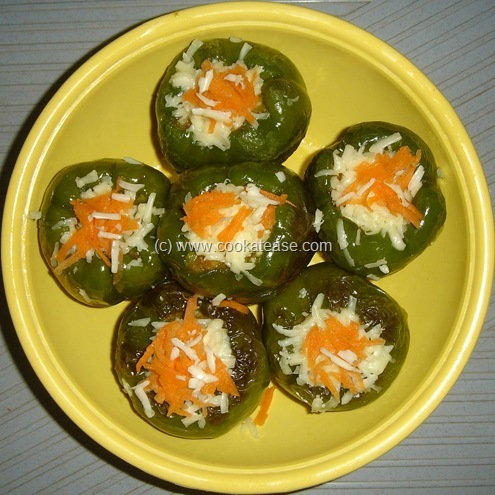 Serve with Rice or Chappati. A stuffed capsicum is cut and shown to view the fillings. Take care while removing the stem and filling the stuffing.